Local artist Cathryn Reitler began an Artist in Residency program in the historic town of Medora, N.D., on July 19. 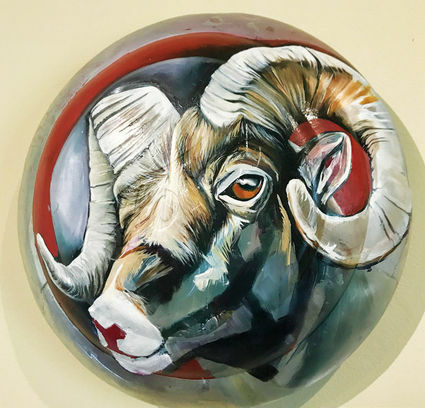 As a part of the program, Reitler is living expense-free in one of the town’s 18th century antique homes, where she is able to paint onsite and has a gallery of her works for sale upstairs. Her residency will commence on July 29, with a reception held in her honor showcasing the pieces she has completed during her stay, along with pieces she created in preparation for the residency. This unfinished painting by Cat Reitler is among the work she is currently developing in Medora. For an artist, the benefits of being in a residency are considerable, as the position provides a substantial amount of time for the artist to focus intently on creating pieces in an inspirational environment, along with a venue to sell their work. Additionally, Reitler finds it fascinating to be able to compare how western culture is portrayed to Medora’s many tourists, with her own experience as someone who actually lives in the west. She also loves the requirement that she work in a public setting, providing her with the opportunity to connect with an art audience and potential patrons. 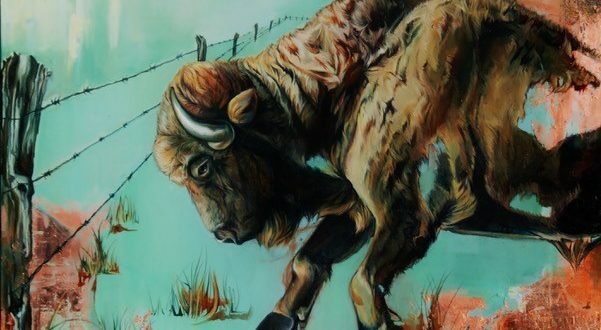 Just days after her return from Medora, Reitler will be at the Northeast Montana fair, where she will have selected pieces for sale and where she will again be painting onsite. For more information about Reitler’s work, you can contact her at 406-671-0659. She is currently taking commissions for the fall and the holiday seasons. You can also check her out at cathrynreitler.com.